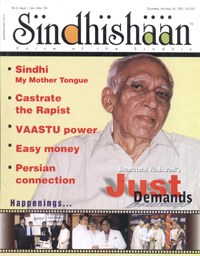 I had received 3 copies of Sindhishaan together – Issues 1, 3 & 4 (missing no. 2) and lastly I have received issue no. 5. I give you credit for collecting such materials. Sindhi community should be grateful to your for all this. I wish the young generation should take interest in your magazine. Please keep it up. My two grand daughters, aged 23 and 20, are all praise for your magazines. As regards your issue no. 5, I wish to point out certain omissions, though that relates to our family. That is about “Leading from the front in the Freedom Struggle of India”. 1 On page no. 32 you have given names of couples, who were imprisoned. You have mentioned my name with my wife, but you have not mentioned names of two elder brothers – (i) Motumal & Jankibehn and (ii) Gobindram & Tulsibehn. Though you have mentioned – “and the list will go on lengthening”, but it was a unique instance that all three couples were in jail. 2 Yet another unique instance was that my wife Kamla was the last person to jump in. At that time, my eldest son, Jagdish was just 2 years old. The trying magistrate, Mr. Rupchand Belaram, permitted Kamla to take Jagdish to jail – the only such instance in Sind. Number of elderly ladies were in the same jail (Karachi) Kikibehn Lalwani, Jethi Sipahimalani, Mohini Lalchand, Kamla Hiranani (who is still alive) and others. A request – can you arrange your issue no. 2 for me ? I have been wrong. Please excuse me. I have written to you, that I have not received one issue (no. 2) of Sindhishaan. But actually I had received the same. My grand-daughter had given the same to her friend. Before I could see it, the issue was gone somewhere else. Of course I appreciate that another girl had taken interest but had I been told, I would not have complained to you.